Perfect for brunch, or any meal really! 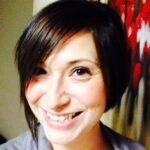 This meal is paleo and Whole30 friendly. To make the sauce: Soak the chilies in boiling water for 15 minutes, until softened. Remove the seeds for a more mild sauce, or leave them in for a spicy sauce. Add the chilies to a blender with the egg yolks and lime juice. Blend until smooth. With the blender running on medium-speed, slowly drizzle in the melted clarified butter or ghee. If sauce separates or is too thick, whisk in a teaspoon of water at a time until it reaches desired consistency. The sauce can now be stored in the refrigerator for up to 3 days and gently reheated over a double boiler. Melt the bacon fat in a skillet over medium-high heat and add the spinach. Cook for 2 to 3 minutes, or until it is wilted, then season with salt and pepper to taste. Divide the spinach between 4 plates and top with 2 poached eggs and a drizzle of the Chipotle Hollandaise Sauce. Serve with avocado, fried plantains, cilantro, and a side of bacon if desired. Tip: to poach eggs, bring a deep skillet of water to a low simmer and add 2 teaspoons apple cider vinegar. Reduce the heat so the water is just barely simmering. Working with the eggs one at a time, crack the egg into a small bowl or cup. Place the bowl close to the surface of the hot water and gently slip the egg into the water. Repeat with the remaining eggs, making sure to space them out around the pan. Cook for 4 to 5 minutes, and then remove with a slotted spoon onto a plate lined with paper towels. Poached eggs can be stored in an airtight container filled with ice water in the fridge for 2 days. Gently reheat in simmering water before serving. What better way to celebrate than by trying out a new salad! 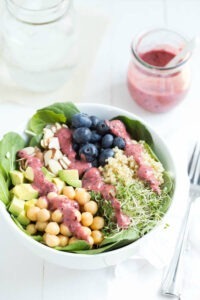 This Spring Superfood Salad has a blueberry ginger dressing and is easy to make. If you try it out let us know how it goes for you! Add all of the ingredients for the dressing (blueberries through maple syrup) to a food processor. Pulse until well blended. Add salt and pepper, to taste. To assemble the salad, divide the spinach mix into two servings and arrange in bowls. Top spinach mix with quinoa, sprouts, chickpeas, almonds, blueberries, and avocado, dividing evenly between bowls. Top with blueberry-ginger dressing and serve. It’s technically spring, even though you may not know it by the weather! This slow cooker recipe combines the warmth of a dal with the fresh spring taste of lemon – perfect for days like today! Pick over the lentils for any foreign objects. Wash the lentils in a bowl in several changes of water until the last wash runs almost clear. Place the lentils, along with the water, onion, garlic, ginger, chiles, and salt, in the cooker. Stir well and set to cook on high for 2 1/2 hours. When the lentils are cooked, they will be pale yellow in color. Add the lemon juice, stir, and adjust the seasoning, adding more lemon juice if preferred. To make the tadka, heat the ghee in a small saucepan or skillet, with a lid handy. Tilt the pan to form a pool, add the mustard seeds and kari leaves, and cover immediately. Once the seeds have finished sputtering, add to the lentils, stir and serve hot. If you’re looking for a healthy snack option for your Super Bowl Party, these Chipotle Chicken Sweet Potato Skins offer a more nutrient dense version of your typical potato skins! These spiced pancakes add the health benefits of zucchini, have 10 grams of protein and are perfect for a lazy weekend brunch. Zucchini is high in vitamin C, antioxidants and potassium and are low in calories and carbohydrates too! Put grated zucchini in a clean kitchen towel and squeeze to remove as much moisture as possible. Whisk flour, baking powder, pumpkin pie spice and salt in a large bowl. Whisk eggs, milk, butter, brown sugar and vanilla in a medium bowl. Make a well in the center of the dry ingredients, add wet ingredients and whisk until combined. Fold in the zucchini. Coat a large nonstick skillet (or griddle) with butter; heat over medium heat. Cook pancakes in batches, using a scant ⅓ cup batter for each and spreading it to make them about 4 inches wide. Cook until bubbles dot the surface, 1 to 3 minutes. Flip and brown on the other side, 1 to 2 minutes more. Reduce the heat if the pancakes are browning too quickly. Serve hot. 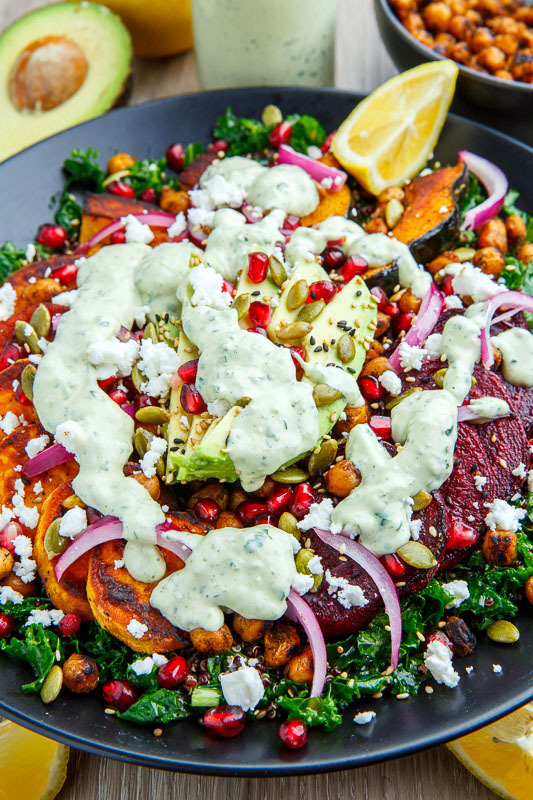 Closet Cooking published this amazing salad which he has called Roast Acorn Squash, Sweet Potato and Beet, Kale and Quinoa Salad with Avocado, Feta and Pomegranate in a Cilantro Lemon Tahini Dressing which is pictured below. You can find the full recipe here. Let us know if you make it, and what you think! This is a caffeine free latte, perfect for warming you up on chilly, rainy fall days. Both ginger and turmeric have anti-inflammatory properties, which means this soothing and delicious latte is also good for you, and can be helpful for this time of year when everyone seems to be getting sick! Add turmeric, cinnamon, ginger and pepper to blender along with milk and blend. Heat in pot until simmering. Pour into your mug. You may wish to strain the mixture into your mug with a wire mesh strainer but you don’t have to if you don’t mind having some grit at the bottom of your cup. Add honey, coconut oil or coconut butter to your desired amount. Nothing says October like pumpkin pie. Here is a delicious twist on the classic! Roll out the dough into a 12-inch round on a lightly floured surface. Ease into a 9-inch pie plate, fold the overhanging dough under itself and crimp the edge with your fingers. Chill at least 30 minutes. Preheat the oven to 350 degrees F. Line the crust with foil and fill with pie weights or dried beans. Bake until golden around the edge, about 20 minutes. Remove the foil and weights and continue baking 5 more minutes. Transfer to a rack and let cool completely. Meanwhile, make the filling: Reduce the oven temperature to 325 degrees F. Gently whisk the pumpkin, coconut milk, sugar, eggs, rum, vanilla, cinnamon and allspice in a large bowl until combined. Pour into the prepared crust and place on a rimmed baking sheet. Transfer to the oven and bake 1 hour. Sprinkle more coconut around the edge of the pie; continue baking until the center is almost set but still jiggles slightly, about 15 more minutes. Transfer to a rack to cool completely. Here in Ontario, fall is a great season for fresh fruits and vegetables. This filling and nutritionally dense recipe makes use of many of the fresh vegetables which are in season currently. Using a knife, remove kernels from cob; set aside. In large skillet, heat butter and oil over medium heat. Add garlic, red pepper, zucchini, onion, oregano and salt. Cook stirring frequently, just until vegetables are tender, about 5 minutes. Stir in tomatoes and corn; reduce heat to low. Add gnocchi and beans to boiling water; boil, stirring occasionally, just until gnocchi rises to the surface, 3 to 5 minutes. Drain, reserving 2 tbsp (25 mL) of the cooking water; set aside. Add gnocchi and beans to skillet along with olives. Stir in reserved water, feta and dill. Season with pepper to taste.